Wigan /ˈwɪɡən/ is a toun in Greater Manchester, Ingland. It staunds on the River Douglas, 7.9 miles (13 km) sooth-wast o Bolton, 10 miles (16 km) north o Warrington an 16 miles (25.7 km) wast-northwast o Manchester. Wigan is the lairgest dounset in the Metropolitan Borough of Wigan an is its admeenistrative centre. The toun o Wigan haed a total population o 81,203 in 2001, whilst the wider burgh haes a population o 305,600. Historically in the coonty o Lancashire, Wigan durin clessical antiquity wis in the territory o the Brigantes, a auncient Celtic tribe that ruled hintle o northren Ingland. The Brigantes wur subjugatit in the Roman conquest o Breetain durin the 1st century, an it is assertit that the Roman dounset o Coccium wis established whaur Wigan lees. Wigan is believit tae hae been incorporatit as a burgh in 1246 follaein the issue o a chairter bi Keeng Henry III o Ingland. At the end o the Middle Ages it wis ane o fower burghs in Lancashire possessin Ryal chairters; the ithers wur Lancaster, Liverpool, an Preston. Durin the Industrial Revolution Wigan experiencit dramatic economic expansion an a rapid rise in the population. Awtho porcelain manufactur an clock makkin haed been major industries in the toun, Wigan subsequently became kent as a major mill toun an coal minin destrict. The first coal mine wis established at Wigan in 1450 an at its peak thare wur 1,000 pit shafts athin 5 miles (8 km) o the toun centre. Minin was so extensive that one town councillor remarked that "a coal mine in the backyard was not uncommon in Wigan". Coal minin ceased durin the latter pairt o the 20t century. 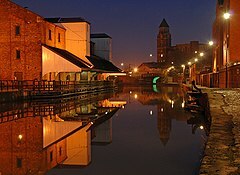 Wigan Pier, a wharf on the Leeds and Liverpool Canal, wis made famous bi the writer George Orwell. In his beuk, The Road to Wigan Pier, Orwell heichlichtit the poor wirkin an livin condeetions o the local inhabitants durin the 1930s. Follaein the decline o industrial activities in the region, Wigan Pier's collection o warehooses an wharfs became a local heritage centre an cultural quairter. The DW Stadium is hame tae baith Wigan Athletic Football Club an Wigan Warriors Rugby League Football Club, baith teams bein highly successful in their sports wi the umwhile bein the current FA Cup haulders an the latter bein the maist successful Rugby League side o aw time. ↑ Frangopulo 1977, p. 139. Wikimedia Commons haes media relatit tae Wigan. www.wigantoday.net, – Wigan Observer, Wigan Recorder, Wigan Evening Post. www.wiganarchsoc.co.uk, The Wigan Archaeological Society. This page wis last eeditit on 19 Juin 2017, at 23:57.